‘Divorced and down on his luck, Gaius Petreius Ruso has made the rash decision to seek his fortune in an inclement outpost of the Roman Empire, namely Britannia. In a moment of weakness, after a straight thirty-six-hour shift at the army hospital, he succumbs to compassion and rescues an injured slave girl, Tilla, from the hands of her abusive owner. 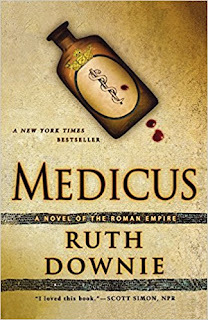 I loved this novel, not only because Roman Britain is one of my passions and I enjoy mysteries – both of those - but primarily because Ruth Downie is such a wonderful writer, and is a pleasure to read. The detail, of things medical, of Britain at the time of the Roman occupation and of daily life is so rich and vivid. As are the characters who are instantly engaging. There is drama, mystery of course (a classic who-dun-it) adventure, thrills, spills, tragedy and humour, all of which is so skilfully included you find yourself laughing, almost crying or holding your breath as you turn the pages as swiftly as you can to find out what happens next. My advice, read this first adventure in the series then move swiftly on to the next, and the next. You will not be disappointed. Really enjoyed this! Great characters and with a lovely touch of humour. I'm looking forward to reading more of the series. Sounds good. I'll go take a look.